December 26, 2014 October 14, 2018 - 75 Comments. On Monday, October 21st, 2013 in a Diners, Drive-Ins and Dives episode entitled “Aces of Authenticity,” the Food Network introduced Torinos @ Home to the world. Just four years earlier–on 22 December 2009–i was one of, if not the very first critics to see greatness in what was then a tiny Italian eatery coaxing amazing flavors from its humble menu. Then ensconced in diminutive digs, it was obvious Torinos @ Home was destined for far better things. During my many return visits over the years, Torinos has never ceased to impress–even amaze–me. Quite simply it’s one of the very best restaurants of any genre in the Land of Enchantment. 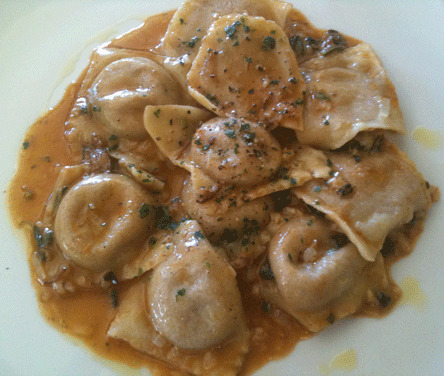 So what makes Torinos @ Home stand out from among so many Italian restaurants in New Mexico. It starts and ends with owners Chef Maxime and Daniela Bouneou who are absolutely passionate about what they do. They have a sincere desire to please their patrons with the very best food they can prepare and they strive to present it as a work of edible art. They relish the challenge of knowing that they have to win over each guest one meal at a time and recognize they can never have an “off” night. Their greatest pleasure is in seeing the smiling faces of very contented guests. How can you not smile when the beauteous Daniela greets you with great alacrity and proceeds to treat you like a much-welcome guest at her home? How can you not smile when a veritable cavalcade of deliciousness prepared by one of New Mexico’s very best chefs reaches your table? A visit to Torinos @ Home is an escape, a temporary respite to a better place, where you’re waited on and treated like royalty. Never has the adage “Everyone’s a critic” been more true than since the advent of the Internet. The blogosphere is a tailor-made venue for the general public to express itself openly, honestly and directly—and openly, honestly and directly the public does. The anonymity of writing online reviews has emboldened in the American culture, a mean-spiritedness equaled only in the vicious, in-the-gutter squalor of politics. At least that’s the outward appearance. Researchers have discovered that when consumers write online reviews, they are more likely to confer positive ratings than negative ones. On a scale of one to five stars, the average online review grade bestowed to products and services as diverse as hotels, dog food and restaurants is about 4.3. The average rating for YouTube videos, according to Google, Inc. is even higher at 4.6 stars. Respondents to TripAdvisor’s online review and rating service accorded Torinos @ Home a perfect rating of five. A perfect rating–that’s as much an anomaly as Romanian gymnast Nadia Comaneci’s perfect ten during the 1976 summer Olympics. It’s akin to Bo Derek’s pulchritude. Out of 85 respondents (as of December 23rd, 2009), 75 rated Torinos “Excellent,” 9 rated it “Very Good” and one sole dissenter said it was only “Average.” There’s a nay-sayer in every crowd. Americans, it would seem are softies, an Oprahesque culture prone to puffery. At least that’s the impression I gleaned by reading TripAdvisor, source of the self-professed “world’s most trusted travel advice.” TripAdvisor, which allows consumers to review and rate all aspects of the travel experience (hotels, flights, restaurants), listed as the number one restaurant in Santa Fe, a humble, rustic little Italian restaurant named Torinos @ Home. Considering that among the City Different’s 327 restaurants are some of the most highly regarded restaurants under America’s spacious skies, is it possible that a restaurant whose name sounds more like an e-mail address than that of a restaurant is that good? Burbling comments on TripAdvisor unabashedly supported the rating with such accolades as “best food in Santa Fe” and “best I’ve ever had” uttered with unfettered enthusiasm. A veritable love-fest for all aspects of the Torinos experience seemed almost too good to be true. The comments would have you believe that at Torinos, heaping portions of ambrosia are served on gilded platters by beautiful maidens. That last line is hyperbole, but not by much. Me, I’m from Missouri…or at least the part of me that says “show me” is. When Daniela Bouneou, one of the restaurant’s owners, invited me to visit her restaurant, she indicated she would be honored to have Torinos @ Home listed on my index of Santa Fe restaurants. She said nothing about Torinos being rated the number one restaurant in Santa Fe or about the outstanding reputation it has garnered since launching in 2006. Obviously she wanted me to find out for myself. As much as TripAdvisor respondents like Torinos @ Home, they love Daniela even more. From the descriptions on TripAdvisor, I pictured an apron-wearing signora with Monica Bellucci’s sultry beauty and the culture and refinement to mesmerize all guests with her graciousness and hospitality–a veritable Italian kitchen siren. Daniela is as wonderful as advertised! Raised in Torino (Turin to most Americans), the capital of Northern Italy’s Piedmont region for which her restaurant is named, Daniela attended culinary school at the precocious age of 14, but opted instead to pursue a career path in the “front of the house” for which her buoyant personality is best-suited. While working as maitre d’ at a four-star hotel in Nice, France, she met and married Maxime Bouneou, the hotel’s promising sous-chef. They moved to Santa Fe shortly thereafter. Their Santa Fe restaurant ventures were initially in the employ of some of the city’s most prominent dining establishments. Maxime served as the Executive Chef at Fuego at La Posada de Santa Fe, a high-profile Four Diamond Award-winning restaurant. Daniela managed The Chocolate Maven for five years. Friends inspired the couple to open up their own restaurant after being completely blown away by the traditional Italian dishes they served during dinner parties at their home. Torinos @ Home was ensconced in the venerable Santa Fe Village, a shopping center with an old west charm just a couple blocks south of the Plaza. For capturing the essence of Santa Fe, few shopping centers can match the Santa Fe Village with its unique local retail stores. Charm and essence are nice, but the truth is, the restaurant didn’t have a storefront presence and its square footage wasn’t much more spacious than a couple of office cubicles. Newcomers relied on smallish exterior signage and a slate board listing the day’s specials to point them in the restaurant’s general direction. Worse, Torinos’ was tucked away in a corner hallway which got awfully crowded during peak hours as hungry patrons queued up for the limited number of tables or lined up to place an order. Though the brightly painted walls–the color of Santa Fe sunlight on one of New Mexico’s more than 300 days of sunshine annually–had a welcoming effect, when you’re hungry, you don’t want to wait no matter how great the food may be. On February 16, 2010, the Bouneous sold their restaurant’s assets and the right to lease their charming spot so they could relocate to Albuquerque where Maxime’s family resides. Aside from familial reasons, Daniela and Maxime wanted a location which could provide the amenities all successful restaurants need (in addition to great food): a reasonable lease, plentiful parking, patio seating and spacious accommodations (the very antithesis of their crowded space at the Santa Fe Village center). It took less than six months for Torinos @ Home to achieve in Albuquerque what it achieved in Santa Fe. Since relocating to the Duke City on May 24, 2010, it has been among the highest rated restaurants on Travel Advisor from over 900 Duke City restaurants rated. More than 90 percent of the respondents participating in the online review rated it “Excellent.” In February, 2010, Torinos @ Home closed its doors in Santa Fe and relocated to the Duke City. Truly Santa Fe’s loss is Albuquerque’s gain. Among aficionados it has achieved near cult status. The Bouneous found everything they sought in the Journal Center off Jefferson Street at the former home of Voila. 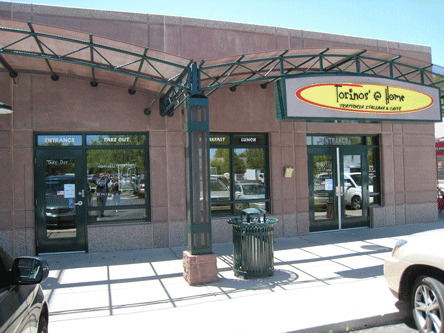 Torinos @ Home has made itself at home in comfortable new digs, launching its Albuquerque operation on May 24th, 2010. Torinos is open for lunch Tuesday through Saturday from 11AM to 5:30PM and dinner from 5:00PM to 9:00PM. Reservations are suggested for dinner. The menu remains a memorable–maybe magical–tribute to outstanding Italian cuisine with a deliciousness heretofore not experienced in Albuquerque. It’s hardly a compendium of all things Italian and it is certainly not a “red sauce” Italian restaurant. Instead, it serves a limited number of items prepared exceptionally well. A larger kitchen also means an expanded lunch menu which now includes Grigliata Di Pesce, a selection of fresh fish—grouper filets, swordfish and scampi– all grilled and prepared with a hint of extra virgin olive oil, fresh lemon and a whole roasted tomato. The antipasti, salads and soups section has also grown and now includes an antipasti platter for two that might elicit involuntary salivation, first when you read its component ingredients on the menu and next when it’s headed to your table. Though the menu section may be entitled “Just A Panini,” Torinos’s sandwiches hardly warrant the limiting descriptor of “just.” These are superb sandwiches! In its annual food and wine issue for 2011, Albuquerque The Magazine awarded Torinos’ @ Home a “Hot Plate Award,” for “Hot Restaurateurs.” The Hot Plate Award is the magazine’s highest honor signifying appetizers, dishes, desserts, drinks and restaurants “that we can’t live without.” What a tribute to Torinos’ that Duke City diners can’t live without this gem of a restaurant. Some critics I trust consider it the only truly great Italian restaurant in Albuquerque with its nearest competition rating a very distant second. A basket of Italian bread and a decanter of herb-infused olive oil will help diffuse your hunger and stave off involuntary salivation while aromatically enticing entrees are delivered to nearby tables. Italian bread is characterized by a crispy crust and a chewy texture and Torinos’ rendition of the staff of life will not disappoint. Until late 2010, the bread came from the world-famous La Brea Bakery in California which boasts of an artisan’s passion, skill and dedication in every loaf. The bread was shipped to the restaurant where the baking process was finished. Thanks to a more expansive space, Maxime now bakes the restaurant’s focaccia and it’s fabulous–better even than the world-famous artisan staff-of-life from La Brea. The olive oil is superb as well. You won’t need any of the sprinkled-on seasonings other restaurants serve. The olive oil is resplendent with the herbaceous freshness of a complementary blend of herbs swimming in the decanter. where they are joined by thin ancho chiles. You’ll also want to save a couple slices for dredging up whatever may be left over of the sauce you select for your entree…and you’ll definitely want to purchase a decanter of this olive oil before you leave. It’s world class stuff! 20 April 2013: Cheryl Jamison is especially besotted with Torinos’ Baccalao appetizer. In chronicling The 10 Best Things I Ate in New Mexico This Year for 2012, Cheryl described the Baccalao as “the ultimate salt cod preparation.” It certainly is a fabulous composition: salted cod fish and Yukon Gold potatoes mashed together with a sweet confit garlic cream. What makes this dish special is how it blends into one dish, familiar yet seemingly disparate flavors. The Yukon Gold potatoes are a perfect foil for the pleasantly “fishy” flavor of the cod. The sweet confit garlic cream lends just enough moistness to prevent the dish from being dry. The dish is served with a crostini topped with a terrific olive tapenade and sun-dried tomatoes. 20 April 2013: While the Baccalao is probably an acquired taste (my Kim didn’t like it), most diners will appreciate an Antipasto quadrumvirate of figs marinated in Marsala, Prosciutto di Parma, Arugula salad, and a goat cheese crostini. This is an appetizer that will excite all 10,000 taste buds while challenging them to discern each of the five recognized taste sensations (salty, sweet, butter, sour and unami). It’s served on a wooden cutting board. Each component is magnificent. Together they create an adventure in flavor. Prosciutto di Parma, one of the best known varieties of Italian uncooked ham, is an intensely flavored (courtesy of dry-aging), thinly sliced ham with a nice fat content. Whether by design or by accident, a generous helping at Torinos is shaped like a rosette on the cutting board. The goat cheese, spritzed with just a bit of honey, is fantastic. It spreads easily on the crostini and is a wonderful counterpoint to the figs marinated in Marsala, a wine frequently used in cooking. The arugula salad is drizzled with the house Vinaigrette which melds magnificently with the peppery greens. 5 April 2014: The Caprese salad may be a simple salad, but it’s imbued with qualities that elevate it to greatness. At its essence, this salad is a concordant combination of flavors, textures, and freshness: ripe tomatoes, fresh mozzarella cheese, aromatic basil, and your choice of drizzle: either or both olive oil or balsamic. Torinos takes this simple salad and raises it to rarefied air. Instead of mozzarella, this salad is constructed with burrata, an almost unnaturally soft and moist fresh Italian cheese made from cream and mozzarella. Burrata is ethereal in its texture and as rich a cheese as you’ll find. A wonderful fresh basil pesto takes the place of the all-too-ordinary basil. Olive oil is drizzled onto the resplendent greens and ripe tomatoes while balsamic circumnavigates the dish. Simplicity meets sophistication can be delicious. 26 December 2014: Implying that someone was “chicken-livered” was of the most deleterious insults one person could levy against another during the late nineteenth century. For offal-loving foodies, the term chicken liver can only mean one thing–deliciousness. Some chefs go out of their way to obfuscate the distinctively rich, creamy and slightly metallic flavor of chicken liver, a favorite tactic being marinating it in or pairing it with agrodolce (sweet and sour) sauces. Kudos to Maxime for not disguising what is really a tender and mild flavor (at least in comparison to beef liver) and letting it shine. Of the many salads we’ve had at Torinos, our very favorite showcases chicken livers in a melange of ingredients all with distinctive personalities. The Iceberg Lettuce & Fegatini Di Pollo features an entire half head of iceberg lettuce, sauteed chicken livers, crostini, Pecorino Romano, radishes, walnuts and a shallot vinaigrette. Easily the star of this sumptuous salad, the chicken livers have that addictive flavor and texture that chicken liver lovers lust after. The shallot vinaigrette brings everything together brilliantly. 22 December 2009: The menu describes its soups as “heart warming.” That’s an understatement! Like mans’ best friend and favorite four-legged companion, a great soup loves you unconditionally. It provides hearty substance and warms the cockles of your heart. It’s equally at home on your sick bed as it is at a sumptuous feast. Torinos’ zucchini cilantro soup is such a soup! Four oversized croutons (perfect for crostini toppings) soak up the well-seasoned elixir while you bask in the liquid love as it slides down your throat. It’s the soup Daniela served me during my inaugural visit and remains one of my favorites. 4 November 2013: How many of us have ordered tomato soup at an Italian restaurant that’s reminiscent of the soup in a can with which we grew up? Not so at Torino’s where tomato soup means oven-roasted tomatoes, garlic, fresh thyme, basil and homemade croutons. There is no cream or chicken broth in this soup. It’s rich, sweet-savory tomatoes at their comfort food finest. It’s a simple soup made extraordinarily well from excellent ingredients. 4 June 2011: Better still is Torino’s rendition of pasta fagioli, an Italian peasant soup which translates to “pasta and beans” (typically cannellini beans). As with many family dishes, the recipe for pasta fagioli varies greatly. Quite often it is made with a stewed tomato or tomato paste base. Torino’s variation is not made with tomatoes, but it is no less fragrant than its red sauced counterpart. Unlike some pasta fagioli, its broth is thick and soul-warming with pasta and beans in perfect proportion to sundry vegetables. My sister-in-law Lola DeVivo Laws, a proud Italian loved Torino’s pasta fagioli so much, every bite brought tears of joy to her eyes. 21 November 2012: In its annual food and wine issue for 2012, Albuquerque The Magazine named Torinos’ duck confit sandwich one of the yummiest sandwiches in the city. It’s one of the yummiest in the state! The canvas for this gem is focaccia bread from La Quiche Parisienne which is layered with a herbaceous (fresh thyme and cilantro) goat cheese spread, duck which has been confit in its own fat for ten hours, and grilled zucchini. This is a magnificent sandwich! The duck is moist, tender and absolutely delicious while the goat cheese spread lends a savory-slightly tart counterpoint. 4 June 2011: Surprises abound with every visit. You can literally expect the unexpected, a twist here and there to any preconceived notions you might have about Italian food. If you thought all pasta fagioli, for example, should look and taste like the Olive Garden’s version, Torino’s will break that paradigm quickly. If you think calamari should be cut into ringlets, breaded, deep-fried and served as an appetizer with some sort of dipping sauce, you’re in for a treat should you order Torino’s calamari entree. Instead of thinly sliced ringlets, the calamari actually resemble large pasta shells. That’s because Torino’s serves them in their natural state minus the tentacles. Maxime stuffs each calamari with pancetta, garlic, fresh herbs and ricotta cheese and serves them with a tomatoes concasse (essentially peeled, seeded and crushed tomatoes) and a tart Balsamic reduction. The texture may be a bit off-putting to some as it’s almost rubbery, but it’s also replete with flavor. It’s a unique way to enjoy succulent squid. 9 December 2011: During our inaugural dinner visit, one of the two featured appetizers was Foie Gras Au Torchon served with applewood smoked duck and fig preserve. Foie Gras, which translates from French as “fat liver” is a highly-coveted, incomparably rich and delicious duck liver that’s been fattened specifically to give it a silken texture and unctuous flavor. This luscious, delicate “meat butter” dish is a foodie favorite and bane of vegetarians everywhere. France is the world’s biggest producer and consumer of foie gras which is at its very best during the autumn and fall seasons when quite naturally, ducks accumulate most fat, particularly on their livers. Torchon, which means “dish towel” in French refers to the way the foie gras is often prepared. It’s truly a delicious irony that the most craved and coveted portion of the canard, a culinary luxury, is traditionally wrapped in humble and lowly dish towels and poached for as long as three days. The results are an eyes rolling back in the head, swoon inducing foodgasm. Torinos’ foie gras is among the best we’ve ever had, heightened by the addition of whisper-thin slivers of applewood smoke duck and a thin fig preserve “trail” that’s dragged on the plate to give you just a sensation of sweetness without overwhelming the make you weak in the knees flavor of the duck. 22 December 2009: The ravioli of the day (a concept no longer on the menu) is what Daniela chose for my introductory meal at Torinos. On this day, the ravioli was stuffed with ricotta and spinach and drizzled lightly with a three-herb (dill, tarragon, chives) butter sauce. Until that point, I’d never had better ravioli! In fact, compared to this ravioli, almost all other ravioli I’ve ever had is on par with the dreaded canned Chef Boyardee variety. The three herb commingling imparted heretofore not experienced fresh herbaceous qualities to the rich buttery sauce: the divine fennel- and anise-like pleasantness of tarragon; the clean and subtle tangy balance of sweet and savory that is dill; and the sweet, mild onion-like versatility of chives. Each of the dozen raviolis on my plate were perfectly prepared and uniform in size. The texture was neither too al dente nor mushy in the least. The ricotta was not dominantly rich as some Italian restaurants serve it, but subtly rich in a manner that complements other ingredients. A generous sprinkle of fresh parmesan topped this fabulous entree. 18 October 2010: Possessing a heart of gold as well as an amazing memory, Daniela remembered just how much I loved the ravioli dish and emailed me when Maxime prepared it with a decadent goat cheese cream sauce. Wow! Who says you can’t improve on perfection! Who says you can’t have too much of a good thing! This dish is the epitome of rich deliciousness. 20 April 2013: Having worked in a fishing village, Maxime is a stickler for freshness. He has cultivated a network of sources which ensure next-day delivery of fresh, just-caught fish. It makes a difference. His preparation of Grouper al Cartoccio is tres magnifique. The grouper is stuffed with Swiss chard, sealed in a crispy filo-like parchment then sautéed and served in a bowl surrounded by steamed clams and mussels. The entrée is then drizzled with a light Pomodoro sauce. It’s already got a spot reserved on my “best of 2013” list. 4 November 2013: Guy Fieri, the loquacious host of the Food Network’s Diners, Drive-Ins and Dives show is a rather skilled chef himself. One of the ways he likes to demonstrate his chops on the show is by predicting the featured chef’s next move: “in the oven at 350 degrees for 90 minutes.” While observing Maxime as he prepared beef cheek manicotti, Fieri seemed at a loss. Either that or he was in awe of Maxime’s meticulous preparation of delectable dish which wasn’t crafted solely for the Food Network, but is available on the daily menu. This entree is absolutely amazing, so rich and delicious grown men will swoon as they eat it and women will consider it better than chocolate. Maxime cooks natural beef cheeks for just over five hours in red wine then combines them with fresh ricotta and stuffs them into manicotti shells. They’re then baked in the oven with Bechamel, Pecorino Romano and Fontina cheeses melted over the top. The richness of this dish should be paired with an acidic side such as the aforementioned tomato soup. It’s a heavenly pairing. 26 December 2014: Italy’s Turin region is credited with the creation of innovative risotto dishes that transform one of the most traditional, comforting and homey of Italian dishes into sophisticated, gourmet-quality favorites. At first glance, Torinos Risotto Al Fegatini Di Pollo appears rather simple, a deep dish of short-grain rice straddling that fine line between being congealed and being perfectly prepared. Its richness and complexity may not be discernible in its appearance, but it sure is at first bite. That richness and complexity is also discernible in its ingredients: white Vialone rice, chicken liver, Porcini mushrooms, Guanciale (pork cheeks) and white truffles, ingredients in perfect proportion to one another and all complementary to each other. Despite its absolute deliciousness, it may not be possible to eat any more than one bowlful of this nearly overwhelmingly rich dish. 20 April 2013: It’s not every Italian restaurant that offers steak on its menu, much less excels in its preparation and delivery. In Torinos’ Bistecca Alla Griglia (grilled steak), we enjoyed a better steak than we’ve had at many a steakhouse. Maxime pioneered the flat iron cut long before it became a popular offering. Until they became so popular flat iron steaks were a much more value-priced cut. It’s a cut that is tender, juicy and which some experts say has the “beefiest” flavor of any cut of beef on any steak. Maxime exploits these qualities to their utmost, serving a fork-tender steak all carnivores will thoroughly enjoy. It is served with a roasted vine tomato and fagioli, the delicious white beans often found on soup. 1 June 2010: When interviewed by Ryan Scott on the much loved and missed Break The Chain radio program, Maxime revealed that spezzatino, a slowly braised beef brisket, is his very favorite dish. It’s almost always on the menu in one form or another. One of the ways in which Maxime prepares it is by stuffing it in ravioli. This is one of many dishes on the menu that has absolutely blown me away. The slowly braised brisket is unctuous and almost preternaturally good. 26 December 2014: Shamefully “Bolognese” sauce in American restaurants has typically meant a meat sauce not entirely different from their de rigueur meat sauce. Bolognese is so much more than meat sauce which originated in the northern Italian city of Bologna. Soffrito, a variety of flavorful and aromatic vegetables fried in olive oil and butter forms the base of this sauce to which chunks of meat are added along with a white wine reduction. tomato paste and stock. Unlike most marinara and meat sauces, this sauce isn’t seasoned with oregano or garlic nor is acidity a strong quality. In recent years, we’ve experienced authentic and delicious Bolognese twice–one in Montecito California’s Trattoria Mollie and now at Torinos where the sofrito includes carrots and celery and the meat includes guanciale, pork jaw and beef from the 4 Daughters Ranch in Belen. 21 November 2012: It’s not quite as rich, however, as Torinos’ Spaghetti alla Carbonara, perfectly al dente pasta tossed with pancetta (Italian bacon), cream, egg, caramelized onion, garlic and parmigiano. It’s one of those rare dishes that is so rich you know you shouldn’t finish it all, but so good you can’t stop eating it. Calvin Trillin, one of the best food writers in America once suggested that instead of turkey, Americans should gather around the table for pasta carbonara. I’d gladly forgo turkey for Maxime’s spaghetti alla carbonara. 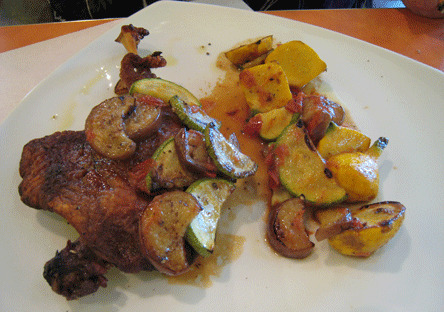 23 May 2010: From the “Torinos Entrees” section of the menu, it’s hard to pass up Anitra al Forno, a duck leg slowly confit for ten hours served with seared polenta and fresh vegetables sauteed with extra virgin olive oil. After your first bite, you’ll lament that so many restaurants seem to believe duck should be fruity-tasting. The flavorful fat from the confit process imbues the duck with flavor through and through as well as a crust that seals in juices. This is a very moist and tender duck leg. 28 December 2010: As refined a lady as Daniela is, it’s always a joy to share a laugh with her when the topic at hand is so unladylike–such as when we discussed the etymology of the popular Italian dish Buccatini Puttanesca. The literal translation of this delicious dish is “whore’s spaghetti.” The origin of the term is in dispute, but what can’t be disputed is just how wonderful this dish is at the hands of a master chef like Maxime. Buccatini Puttanesca is a lively entree–pleasantly piquant, a bit salty, tantalizingly tangy and wholly delicious. At Torinos, its construction includes anchovies, olives, capers and other complementary ingredients. The anchovies are discernible, but not so much that the anti-anchovy crowd will disdain this wondrous dish. Torinos’ pasta dishes include one aptly named “Tagiatelle Gorgonzola “For You Blue Cheese Haters,” though for this fan of fetid fromage, it’s hard to imagine anyone not liking stinky cheese, the more rancid and blue the better. I suspect Daniela and Maxime are having the last laugh because gorgonzola is itself a blue cheese, a veined Italian blue cheese, in fact. Like other blue cheeses, it can be crumbly and salty with a pronounced bite. On tagliatelle, this cheese finds a receptive canvas. The tagliatelle, a long, flat ribbon-like pasta similar in shape to fettuccine, is perfectly prepared; the sauce is surprisingly subdued, a rich, buttery, but not overwhelming sauce. 9 December 2011: Dinner might mean something unexpected such as a featured special of roasted prime rib au jus served with a potato gratin and vichyssoise carrots. The prime rib is a slab of wonderfully roasted (Lowry’s quality) just-off-the-bone prime rib with a perfectly pink hue redolent with a peppercorn enhanced au jus. It’s nearly fork-tender and as juicy as any prime rib you’ll ever have. The potato gratin is a beauteous brick of thinly sliced and layered potatoes and cream seasoned with garlic. The top layer is beautifully browned and each layer underneath perfectly prepared. While the term vichyssoise is most often associated with a cold French soup, the term actually means “from Vichy” a city in France. Torinos’ vichyssoise carrots have a sweet (but not overly so) flavor and a crisp texture (a boon for those of us who don’t want mushy carrots). 13 August 2011: In season, one of the most overdone ingredients on restaurant menus is butternut squash. Unfortunately more often than not, restaurants tend to prepare it to a near-dessert level of sweetness. Instead of letting its natural sweetness shine forth, chefs tend to add sweetening spices to its creamy beige flesh. At Torinos, Maxime pairs the butternut squash with fresh ricotta and stuffs them into hand-made manicotti then tops the manicotti with extra virgin olive oil, caramelized onions, Bechamel, Pecorino Romano and Fontina cheeses melted on top. It’s some of the best manicotti you’ll ever have times five, the pairings of ingredients heightening the best in each other. 5 April 2014: For seafood lovers, few things are as satisfying as a rich, hearty seafood stew, whether it be cioppino or bouillabaisse. There are several similarities between the Italian-Portuguese cioppino and the French bouillabaisse, both of which have their genesis in the pots and cauldrons of the scions of ancient Mediterranean fishermen. Chef Maxime, a French man who cooks Italian food, can call his seafood stew anything he wants as long as he serves it. Cioppino is a very nuanced dish that takes on the personality of the seafood from which it is constructed as well as the distinct seasonings which give it its kick. Torino’s rendition includes shrimp, Pacific cod fish, mussels, clams and calamari in a star anis clam broth. It’s a San Francisco-worthy cioppino showcasing fresh seafood in a sumptuous broth. You won’t leave a drop. 5 April 2014: In the November 8, 2012 edition of Tasting New Mexico, scintillating author Cheryl Alters Jamison introduced readers to the “top five New Mexico spots for divine gnocchi.” Not surprisingly, the Gnocchi Spezzatino, made the list. This gnocchi is made from homemade potato dumplings and an organic beef brisket braised for five hours in red wine. The dumplings are delicate, smooth and rich while the beef brisket is so tender it falls apart much like carne adovada. The red wine and beef reduction may be the highlight of a dish whose every component is absolutely fabulous. 26 December 2014: Mention fried ravioli and the image conjured by most foodies involves the fried, breaded ravioli appetizer invented in Saint Louis, Missouri where a strong Italian culinary lineage exists. At Torinos, fried ravioli involves a dessert, three circular ravioli stuffed with apricots and ricotta then sprinkled with confectioners’ sugar and encircled by vanilla Mascarpone cream. There’s only one thing wrong with this dessert. It’s that three of these decadent ravioli aren’t nearly enough. 13 August 2013: Legend has it that when needing a “pick me up” in between amorous trysts, the courtesans of Venice would consume Tiramisu (the literal translation of which is “pick me up) to boost their stamina. An addictive, rich and ethereally light Italian dessert, when made right it will leave an indelible impression on you. The very best tiramisu I’ve had in the Albuquerque area has been from Blades’ Bistro in Placitas, Joe’s Pasta House in rio Rancho and Nicky V’s Neighborhood Pizzeria in the Duke City. That is, those were the best until I sampled Daniela’s Tiramisu at Torinos’ @ Home. It’s also the most authentic tiramisu I’ve had, wholly unlike the “cake” type tiramisu some restaurants serve. That’s pseudo tiramisu. Daniela’s rendition is served in a concave bowl, the discernible melding of spirits, espresso and cocoa defying convention by being both whisper light and having body and texture. 9 December 2011: Some diners might not brave a dessert which translates from French to “half cooked,” but then they’d be missing the rich deliciousness of Torinos’ chocolate mi-cuit. Similar to the molten centered chocolate cakes served in highly regarded restaurants such as Roy Yamaguchi’s eponymous Roy’s, this is a chocolate cake so decadent it can only be finished if shared. Torinos’ rendition is topped with vanilla ice cream and served with amarena cherries. Amarena cherries, grown mostly in Bologna and Modena, Italy, start off as slightly sour cherries, but they’re preserved in a rich, sweet syrup that makes them nearly cloying. The vanilla cuts the sweetness nicely as does the adult chocolate. 21 November 2012: If you’re in the mood for something not quite as rich or decadent, the pistachio square is the dessert for you. Pistachios are a versatile nut that can serve not only as a snack food, but in entrees and desserts. They lend a savory quality to desserts that are would otherwise be cloying– such as baklava at Yasmine’s Cafe. The pistachio square is a tarte in which finely chopped pistachios are the star and creme Anglaise is a counterpoint of sweet richness. The tarte is dense and moist with an excellent crust. Torinos does a bustling take-out business, the best way to curb the inevitable cravings you’ll experience after a meal at what became, after only one visit, my favorite and highest rated Italian restaurant in New Mexico. Anything on the menu is available for carry-out. Dinner from Torinos, even if you have to warm it up yourself, is the next best thing to dinner at Torinos. Also available is a little store adjacent to the restaurant in which Italian goodies are sold. You’ll want to stock up on Maxime’s olive oil, biscotti, chocolate croissants (more on these later), homemade jams and a veritable treasure trove of other exciting and interesting items. Daniela introduced us to her favorite candies growing up in Italy. They’re wrapped similarly to saltwater toffee, but are wholly unlike saltwater toffee in texture. Best of all, they’re available in various flavors (pear, anise, mint, apricot and more. Outstanding food, reasonable prices and portions, exceptional service…not to mention the fabulous Daniela. Torinos @ Home is as much about the experience as it is about the food. Was it Santa Fe’s best restaurant? A phalanx of restaurant critics say it was. Will it be Albuquerque’s highest rated restaurant? Daniela invites you to find out for yourself. When Torino’s @ Home came up om this year’s Restaurant Week Kay and I decided to give it a try. The House and Caprese Salad’s were quite good and large enough that we had them put some in a take out box so we could cope with the entrees. The Pollo Al Limone was a tasty delight. The lemon adding an interesting flavor profile to the braised chicken. The chicken was tender and wonderfully moist, a rarity in many chicken dishes. The Beef Cheek Manicotti was a very rich dish with great flavors from the wine and cheeses used in its preparation. Though memory may not serve correctly today’s rendition seemed to have quite a bit less braised beef cheek in it than what I had previously and it seemed more soupy with a lot of liquid. I asked for a spoon to eat it because a fork was not up to the task. We both opted for the Tiramisu for desert. OMG what a heavenly delight. Overall great food and great service. If this is any indication of what the new owners will do, Torino’s @ Home will continue to be a precious restaurant. Adios to Daniela and Maxime Bouneou, Last Monday they sold Torinos’@Home to Jenna and Daniel John who are now the new owners operators of the restaurant. Maxime and Daniela sold Torino’s @ Home on February 15th. They both are wonderful people. I wish them the best in whatever they do next. Just a word of advice about Torino’s. They are now open on Mondays. One more day of the week to enjoy the best Italian food in NM. Even a tuna salad panini get star treatment at Torino’s. There is only one word to describe a meal there: Excellent. I was going to write “first rate” and then counted the words…….. Excellent food, service, ambiance and even a superior beer list that thankfully does not include Pabst Blue Ribbon. During a conversation with Maxime I mentioned that the very best restaurants in ABQ are those with a husband/ wife in the kitchen with the other spouse patrolling the front of the house. “That is the same all over the world”. Torino’s, Blade’s Bistro, Budai,The Grove, Joe’s Pasta House all fit the description and all are excellent. Made it to Torino’s this past Tuesday for dinner. Torino’s continues to be an absolute gem of a restaurant. My comment centers around just one of the elements that set it above the rest….. The burrata served with an antipasto dish with coppa. I remember the first time I had that type of mozzarella at an eatery in Los Angeles and it was unforgettably delicious. Well, the old adage about “the first time” being the best is in doubt after having the stunning burrata at Torino’s. Great food. Great Service. The antipasto was incredible. The tiramisu may not be as stated “the best in the universe” but we haven’t eaten everywhere in the universe. It was fantastic, perhaps best on this planet. A few minor changes. Without getting into pronunciation of pierogi. I might do shallots in place of the onions. Pierogis as a side might be a tad much. Kielbasa sounds great, I only wish there was a local maker so I could avoid the packaged types although in a pinch I’d go with it. I remember the kielbasa from local Polish delis when I went to school in Buffalo NY a bastion of Poles and their foods. Packaged varieties pale by comparison. We part ways when it comes to holding back the mustard and pastrami without mustard is like peanut butter and jelly without either peanut butter or jelly, even Welch’s. Pierogis on the side would be great but not the cheese, onion, potato variety, no cheese necessary, but it would make a heavy dish even heavier especially if I served it with either sour cream or FAGE non fat yogurt, as close to sour cream as you can get. I think my cardio guy wouldn’t mind a $10 size but would probably blanch at you supersized $25 version. I’ll let you know how it comes out. Moderation is his secret word for recovery. Yo El Brute, apparently someone else considered some kielbasa http://tinyurl.com/kc7b9yx as a side as well, which would nicely accommodate my “dispenchant” for uni-dishes. In addition, I would add at least two butter-sauted, (probably cheese-onion-potato filled in this case) pierogies. (Alas, with all do respect, pronunciation is the thing! LOL So often people say peh row kees when it actually is, IMHO, pee’_eh r r r o kees http://www.forvo.com/word/pierogi/ where there is a bit of a trill to the ‘r’ as one might do in Spanish! If possible, hold your mustard a tad to just savor some kielbasa in and of itself much as one might do for a bit for pastrami. Lastly, tell me you pass all this on to your Cardiologist for approval!!! Pronunciation aside the recipe is rather simple, few ingredients, and I’m wondering if is a side to be eaten with kielbasa. Or pork chops or is it a base, much like one would find in a cassoulet? It does look better than it sounds. I’ll try it at home and let you know. I might “Brooklyn” it up with some additions I haven’t selected yet. Mustard seems to be the condiment, eh? Hee ho la Hombre, my esteemed colleague from Brooklyn! Thanks for your attempt to keep me In The Groove of things, but alas Wop…not whop…. is actually the derisive spelling that I did not use which some apply to some Italians. Apparently, originally it was to stand for: With Out Papers…way back when, e.g. the early 1900s when Europeans were flooding into e.g. Ellis Island http://en.wikipedia.org/wiki/Wop. Why it landed specifically on Italians, I do not know. The ‘L’ in haluski is to have a ‘wu’ sound that I apparently didn’t do well representing phonetically; Sorry! When correctly written, it has a line through the middle, but so as not to mistaken the ‘L’ for a “T”! Bottom line, I hope this pronouncing site will help http://tinyurl.com/q9xmftn Scroll down just a tad to click on the video for several examples! ~ Alas…Goombah!!! again!! !….as I’ve noted before and for which you need a ‘whop’ upside the head for not learning, Goombah does have an amicable meaning e.g. http://en.wikipedia.org/wiki/Goombah, albeit a few might use it otherwise. E.g. Google “Goombah”! ~ Re Kelly O and 7 to 10#s: Normally I’d agree, but not wishing to be unPC nor appear elitist (and given my options age wise in life), I opted to enjoy, more than usual, how the Haluski was ‘distributed’ in combination with her ‘personality’. Re my making some haluski? While I try to utilize my strengths, I humbly acknowledge I have limits, e.g. being unskilled at washing up dirty pots n pans, and thus defer to others the making of Haluski to sample!!!! Watched you recipe starring Kelly and cabbage. Real peasant food, not that there is anything wrong with that. Ms. Kelly did not pronounce it they way you suggested and if I was Italian I’d be upset about y our use of the word “whop” which is as bad as your use of goombah. Both sound like you have a definite distain for Italians. $25 bucks for ingredients sounds like you’re cooking for yourself and your legion of “feministas”. I would think that $10 would feed all your exes and a few Linda Beaver wannabes easily. The recipe seems very, very simple, why don’t you make it for the first FOG pot luck meal? And Kelly is about 7 to 10 lbs away from her ” looking great” weight. Maybe it was too much haluski. Diners/Drive-Ins/Dives is doing a repeat of the visit to Torino’s tonight on the Food Channel about 8. As previously noted, I understood this was to be a new visit. In tracking the time down now, I note at 5:30 there’s a repeat to “New Mexican eats in Albuquerque” which also includes a segment of my Fav, Kelly O making ‘Haluski’ (the ‘l’ is pronounced “wu” as in whop…LOL Never heard of this Polish dish previously in my MA hometown nor was it made by my Babci or Panis in the environs, but it looks delishiously ‘healthy’ as does Ms. Kelly http://tinyurl.com/mp7zhhz. Say, I’d be willing to spot 25 bucks for ingredients to one of youz who fashion yourself being a home-chef, to make some to bring samples to our next FOGies’ Gathering! a n o t h e r show on T@H per having chosen it “as one of the four best Italian restaurants Fieri has visited.” Suppose to air March 28; check local listings for time. Yo Jim, re The Gathering…I hear ya on that. Sometimes when I’m getting a bit afield, I’ve tried to use ‘About this Blog’ or ‘Blog’s User Guide’ to signal a posting that is somewhat off or not quite on a food/restaurant topic. Not sure what space Gil has whereby he might consider, let alone be able, to add a Header like “Tid-Bits” or “Off Topic” or “Get-a-Room” or “Mitote” etc, so as not to encumber/frustrate Folks who have understandably little time, given all the things we are bombarded with, to read ephemeron. We dropped by for Dinner last night and I had one of the specials, Venison Osso Buco and tomato soup. The Child Bride made do with Beef Cheek Manicotti and a Caprise Salad. We loved both and since there is a reason one of us is slim and trim we had 2/3 of the Beef Cheek Manicotti for breakfast this morning. I am concerned because when we arrive at 7pm on a Friday night the place was only about 1/4 occupied. By 8pm it had filled to about 2/3 full but was starting to empty. I know that one major reason is that the location is great for lunch business with so many businesses in the area but terrible for dinner as few live anywhere in the area and there is not much shopping to bring people in evenings. Please keep Torinos at Home in mind when you get hungry evenings. I also have another question for those smarter than me (many will say that is almost everybody). I have a strong feeling that Jim Millington making comments on the Dog House will attract very few readers of this blog to even read the comment thus depriving them of the knowledge on the “Friends of Gil Dinner.” Any suggestions. I cannot afford a prime time TV ad. You might be surprised at how well-read most comments are. On average a new comment is launched about 50 times on the day it’s posted and to a lesser extent on subsequent days. I suspect visits to comments translate to some degree of restaurant visits, so it behooves readers to share their positive experiences on restaurants they like. That said, point well taken, Jim. I’ll publish a post announcing the FOG dinner after I get back from the Taste of Rio Rancho (http://www.rioranchonm.org/index.aspx?nid=260) unless I’m exhausted from having sampled some 73 items. Both the FOG dinner and the Taste of Rio Rancho should not be missed by serious foodies. Bob is a treasure trove of knowledge when it comes to Albuquerque and has been here for 40 some odd years. We covered everything from food to football. We shared our admiration for Gil Garduno and this wonderful blog, discussing some of our favorite fellow bloggers. Hopefully we can share a meal and good conversation with other someday. Enjoying a good meal with friends both old and new is as good as it gets, especially for me, all things considered. Per above, had the pleasure of “being able” to sup at Blade’s last eve with gastronomic cohort, Big Bruce, and to learn of his “unexpectedly” staring down the Grim Reaper who tried to go toe-to-toe with this guy with, ironically, a big heart for his community. Talk about ‘luck’! He is also married to vivacious Grace who will be his archangel in the months ahead, given the plethora of info she has gathered about what happened, rehabilitative options, e.g. nutritional needs, alternatives, and no-nos, etc., in addition to her own infectious joie de vivre (and soccer) she brings to the table. So, as might be heard at Blade’s: Proost…or Salud or Cheers….L’chaim! to Bruce and any of Y’all…and if ya have a Honey, get up & go squeeze ’em! Heeholah! I don’t know! Saturday nights are traditional Baahstan Baked Beans and Franks. But OK…Maybe if you promise it will be Gracefull!!! I will definitely!!! Tell me the time you set it up for a table with The Anja! Eh! If you are…. I’m open to others telling ya they’d like to crowd in as well. Yo! A Fiesta! I think my “goombah” is more phonetically correct versus your dictionary pronunciation. That said I remember during a stint at the Univ. of Buffalo that my roommates and I would venture down to the Prince pasta company on a certain day of the week and buy cut rate spaghetti for the apartment. I remember it was a very large amount for a very nominal cost, I just forgot which day it was for the bargain. Prince spaghetti day was most of the days of the week. The “especial” for the weekend is lamb shank, can you make it?